I played several times, but I did not win anything good. Best I've got from this so far is .10 sit n go, I play every day. I play every day. I win school pass usually and 0.10 sit and go sometimes. Every day,,,only way to get tickets,since their Mods don`t give out tickets like there supposed too for watching training videos,posting and such. Boo,royalraise. Congratulations! I haven't received it yet.. I've played those tournaments, the next one is 11 / February, it's a very tough tournament because you start with 2,000 chips and the blinds go up very fast and more than 10,000 players come in .. I'm not very interested in playing that tournament! Sometimes i win the ticket. Yes, I play a luck card at the poker school, sometimes tickets for tournaments come across to me but very rarely, but there is a chance to win the Jackpot! I mostly get school pass tickets that I never use and sometimes I get 0.10 tickets. I wanted to play but my poker account is not eligible to participate in that promotion. Yes I play it as should everyone who can it is free! So far I've won 2 "School Pass" tickets (which are the worst prizes in this game imo). I played for like 3 weeks (with 10 tickets per week available) so it's all kind of frustrating. I always seem to win a small ticket, sometimes even two, just before the jackpot is won. Periodically I play a luck card, in most cases losing positions, and sometimes there are tickets drop out basically on school pass and sometimes freboys, there is little hope that when the jackpot may fall out. .Every week I get 16 tickets. I play every day. Won several tickets of different denominations. There hasn't been a jackpot yet. i play every time when i log on poker stars (if not forget) and win the about 3 tickets already, I appreciated. Yes won something small roughly one in every 15 scratchcards school pass tickets are good one 3.30 ticket from one before then cashed for 50 dollars in 3.30 dollar tourney you can not win if your not in. I play it every week, pretty much from when it started. Mostly get those useless school pass tickets, sometimes a $0.10 ticket and very rarely a JP Freebuy or monthly freeroll ticket. I did once win a $1.10 ticket a couple of years ago, which must be the hardest thing to win after the Jackpot. I have played that and let me tell you all I have won are school pass tickets and 10 cent sit and go tickets, and some freeroll thing. Have never won any big ticket or jackpot. I´m play every day, but the prizes are tickets and more tickets. 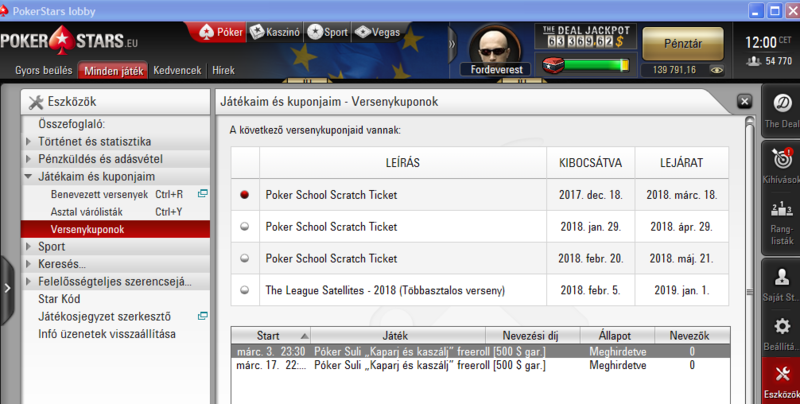 I have not been able to access scratch and match on Pokerstars for quite some time. Is the scratch and match game still up and running? If it is any idea why I no longer have acess to play it? I just tested it, yes it still works. I don't know why you cannot play? 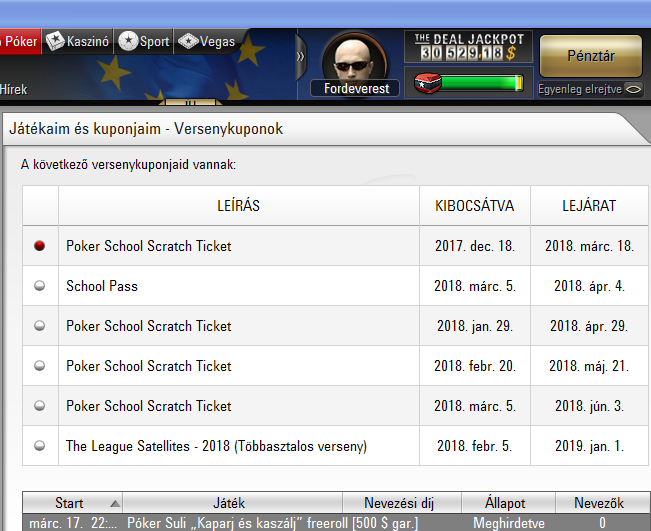 Can anyone who just made a deposit and registers at pokerstarsschool play scratch & match everyday forever? You can play every day. Forever - I don't know but maybe sometimes it changes to another game..
Well I didnt know what scratch & match was before. And thanks to you mate, I just won a school pass ticket to a couple of tourneys! I chose a 15* 1$ spin n go tourney but I dont get it. Should I win everyone in that tourney to get my reward? Any advice? The odds of winning big on this are not good so have fun as its free but best to concentrate on your game than spinning roulette wheels. When they run the freeroll of $5000 or $10000 they often splurge many thousand tickets through the system so your odds of getting a ticket are much higher and very likely. However I played these for 3 years and the most I won was a freeroll entry to the $10000 which attracts as as many players so the odds are not great but its free. Still for $5 you could get direct entry to a $10000 tourn with a much lower player turn out so higher odds for you to enjoy. Enjoy but focus on your skill set not on chancy games. You never know the jackpot awaits just dont focus on these too much look at your skills instead. I play it, and I win tickets, monthly freeroll, jp frebuy, 0.10 and school pass. In the tournaments the winnings are a few! These are awesome. Play them everyday it takes maybe 3 mins to do them everyday because of 2 mins wait after the first 1. You get 16 cards per week and can use 3 per day but twice a week you will see a link pop up to get additional card if you share link via twitter. You might never win the jackpot but there are other prizes. I have won a couple of spin n go tickets using the school pass satelite I have also won 2 $3.30 tickets as well one of which I was able to turn into abour 17 bucks. There is also a monthly freeroll ticket that gives you access to play $500 freeroll. The freeroll is actually fortnightly now so every 2 weeks there is $500 prize pool up for grabs. I have cashed for more than $100 in these over the past couple of years. I have multiple final tables with a win and a 2nd . Like Joe said above, it only takes 3 minutes a day to scratch those 3 tickets - really fast stuff! Yup, I do it every day, too. Since I'm a night owl, I always do it right after midnight, so I cannot forget about it.